It’s a culinary catalyst, an agent of change, a gastronomic rock star. Ubiquitous in the world’s most fabulous cuisines, butter is boss. Here, it finally gets its due. 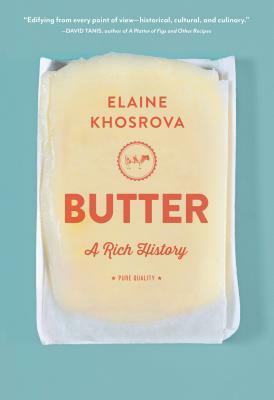 After traveling across three continents to stalk the modern story of butter, award-winning food writer and former pastry chef Elaine Khosrova serves up a story as rich, textured, and culturally relevant as butter itself. From its humble agrarian origins to its present-day artisanal glory, butter has a fascinating story to tell, and Khosrova is the perfect person to tell it. With tales about the ancient butter bogs of Ireland, the pleasure dairies of France, and the sacred butter sculptures of Tibet, Khosrova details butter’s role in history, politics, economics, nutrition, and even spirituality and art. Readers will also find the essential collection of core butter recipes, including beurre manié, croissants, pâte brisée, and the only buttercream frosting anyone will ever need, as well as practical how-tos for making various types of butter at home--or shopping for the best. “Irresistible and fascinating. As a pastry chef, I am elbow-deep in butter every day; it is in nearly every pastry, cake, and cookie, and slathered on our toasted bread, yet reading this I realize how much history there is behind this ingredient that we take for granted. For the history, use around the world, and modern recipes and techniques (smoked butter!) this is one of those definitive books on a subject that every cook should have."